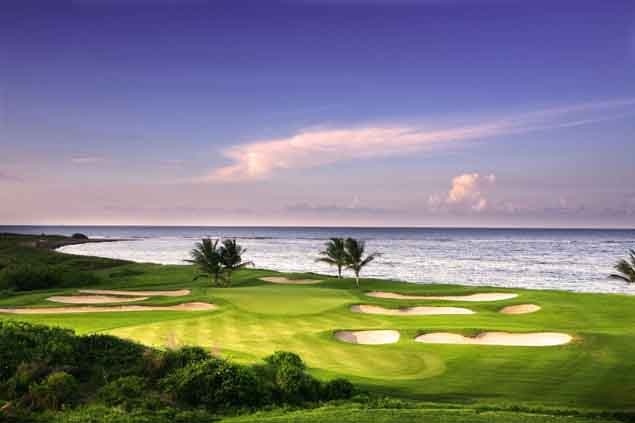 One of the top rated championship golf courses in the Caribbean, Royal St. Kitts Golf Club offers 18 picturesque holes stretching the black sandy beaches of the Atlantic Ocean to the calm waters of the Caribbean Sea. After closing for renovations in the spring of 2002, the first nine holes and the beautiful new clubhouse opened for play in November 2003. The full 18-hole championship course then reopened on November 8th, 2004. 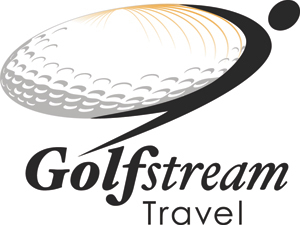 In 2004, famed Canadian architect Thomas McBroom completed the much-anticipated renovation of Royal St. Kitts Golf Club that displays his signature attention to detail, strategic intrigue and stunning beauty. The hallmark of a McBroom golf course is a design that captures the unique character of the landscape so that each course possesses its own distinct personality, charm and playing experience. 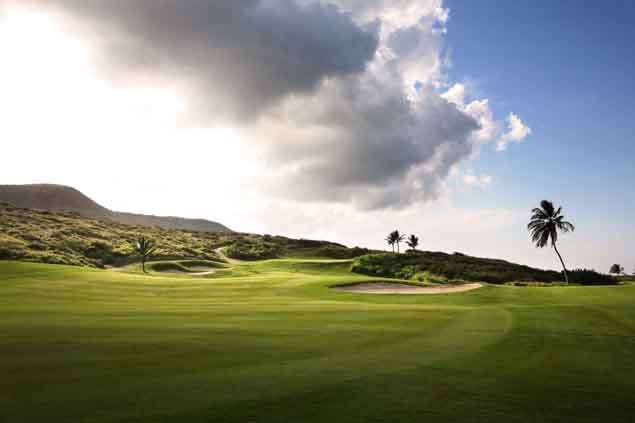 McBroom’s design at Royal St. Kitts covers 125 irrigated acres of lush grass and allows golfers to play two full holes on the Caribbean Sea and three complete holes on the Atlantic Ocean. The extraordinary layout boasts water hazards on 10 holes, 80 bunkers and a multitude of coconut palm trees along the Atlantic Ocean. The course plays as an 18-hole, par 71 at 6,900 yards from the championship tees. Four sets of tee complexes allow golfers of all skill levels to enjoy a fair, yet challenging, golf experience. 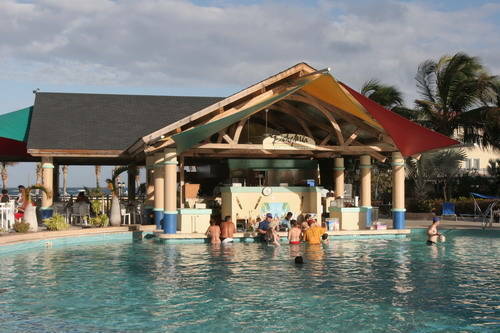 The Frigate Bay House, the resort's main building, features luxurious St. Kitts accommodations. The Marriott St. Kitts includes Garden Houses featuring guest rooms, 1 and 2-bedroom hotel suites. Most guest rooms offer private balconies with incredible views of St. Kitts and the Atlantic. Enjoy luxurious amenities, including shower/bathtubs appointed with relaxing massage showerheads. All accommodations are equipped with coffee makers, CD/alarm clocks, hair dryers and refrigerators. High-speed Internet access is available throughout our St. Kitts resort. 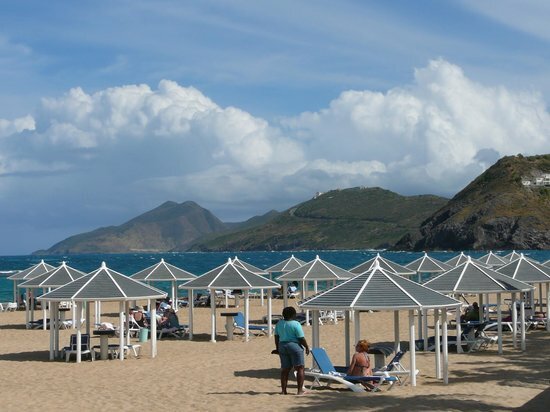 Luxury Spa on St. Kitts - Rejuvenate the mind, body & soul with detoxifying body treatments, relaxing massages, full salon for hair and nails, beach massage cabanas, & nourishing skin care services. Warm and sophisticated, this "city-style" steakhouse serves succulent cuts of beef and seafood, along with an international wine list. Reservations Recommended, Elegant Casual Attire please. Credit Cards/Room Charge Only. Specializing in the dishes of Northern Italy, La Cucina delights guests with a beautiful rustic setting and a wide selection of Italian and International wines. (Open for breakfast seasonally). Credit Cards/Room Charge Only. A popular spot for family dining, Calypso features buffet and a la carte selections emphasizing local ingredients that include fresh fish, fruits and vegetables. Open daily for breakfast and lunch. Credit Cards/Room Charge Only. This casual poolside St Kitts restaurant serves unbeatable salads, burgers, sandwiches and frozen drinks overlooking the beach and ocean. Stay cool at the swim-up bar or under the covered patio. Open for lunch daily. Credit Cards/Room Charge Only. Enjoy flavored coffee, espresso, sandwiches, snacks and pastries daily at the Café, located at the entrance to Calypso. Serving breakfast, lunch and late night dinner. Credit Cards/Room Charge Only. Keep it casual with homemade pizza and ice cream served at this outdoor patio restaurant. Seasonally open for Lunch and dinner. Credit Cards/Room Charge Only. Located at the Royal St. Kitts Golf Club, guests can toast to their success on the greens with frosty beers, soft drinks and lemonade. Open for lunch, serving towering burgers, sandwiches and other fare. Seasonal hours. Open daily for those looking for a casual dining atmosphere. On select evenings guests will enjoy live entertainment.